Actions speak louder than words. Brands spend millions of dollars on external messaging to define an emotional connection with the customer. However, when a customer perceives a disconnect between an employee representing the brand and external messaging, they almost certainly will experience brand ambiguity. The result severely undermines these investments; not only for the customer in question, but their entire social network. In today’s increasing connected world, one bad experience could be shared hundreds if not thousands of times over. Bottom line, frontline employees must be authentic representatives of the brand. Simple enough, right? Nearly all rational managers will agree with the above statement. But how does management ensure that employees animate the brand? – It is a process of alignment. Align external messaging with customer expectations: Repeatedly test the effect of external messages on customer expectations. Ask yourself, what expectations are we instilling based on our messaging? Additionally, the next four steps will help ensure that operational staff fully understand and are equipped to handle these promises made to customers. Align customer expectations with company service standards: Even in the most sophisticated and progressive companies, standards of service delivery can be out of sync with customer needs and expectations. One reason is that customers are seldom involved in the writing of these standards. Rather, service standards tend to be the product of mid-management committees, resulting in a hodge-podge of ideas and opinions that are more a reflection of operational expediency than of customer expectations. A better practice is to calibrate service standards against customer needs, expectations and experiences. Align service standards with training content: Training should arise from standards, not vice versa. Bring training managers into the process from the beginning, ensuring that as standards are adjusted, training content will follow. Align training content with frontline execution: The success of most training programs is measured in terms of the participant’s ability to recall the content, rather than to apply the information on the job. A more proactive practice is to identify specific deficiencies in service delivery and adjust training content to address those deficiencies. Align frontline execution with rewards and incentives: At the managerial level, incentives tend to be in the form of quarterly bonuses linked to metrics such as customer satisfaction and service execution scores. However, you can go farther. Depending on the data available, consider rewards on a much more immediate and shorter cycle. For example, on a daily basis, call centers agents can receive bonus points that are immediately redeemable at on-line redemption sites. Or a bank teller may receive an immediate reward if they display the appropriate behavior to a mystery shopper. Thus, employees receive quick, meaningful rewards that reinforce the specific skills that are needed to improve customer experiences. These are five steps to align the customer experience with external messaging. How do you ensure your frontline employees are authentic representatives of the brand? What one word would a customer use to describe the experience at your bank? Would your customer experience be described as professional, knowledgeable or informative, or would it be described as frustrating, disappointing, inexperienced or rushed? One simple and elegant tool to get a picture of your customer experience is to ask customers what one word they would use to describe the customer experience. Kinesis recently mystery shopped six major North American banks to evaluate the state of the sales and service process at these institutions and identify potential drivers of purchase intent in the customer experience. Shoppers were asked a mixture of closed-ended questions to evaluate the presence or frequency of specific behaviors, and open-ended questions to gather the qualitative impressions of these behaviors on the shoppers – in short the how and why behind what the shopper felt. Part of this research plan was to ask shopper to describe their experience with one word. Finally, to provide a basis to evaluate the effectiveness of each of these brand attributes, shoppers were asked to rate their purchase intent as a result of the visit. This purchase intent rating was then used as a means of evaluating which attributes tend to be used to describe experiences with positive purchase intent compared to those with negative purchase intent. The descriptions we received from mystery shoppers ranged from professional, knowledgeable, and informative to disappointing, frustrating and rushed. This list of adjectives alone was interesting; however, the purpose of this research was to identify drivers of purchase intent, in part to differentiate experiences with positive purchase intent compared to those with negative purchase intent. So…how did the customer experience in mystery shops that reported positive purchase intent differ from those that reported negative purchase intent? –OR- Specifically, what adjectives did shoppers use to describe the experience that created positive purchase intent compared to those that created negative purchase intent? Shoppers who reported purchase intent used the following adjectives to describe the experience. 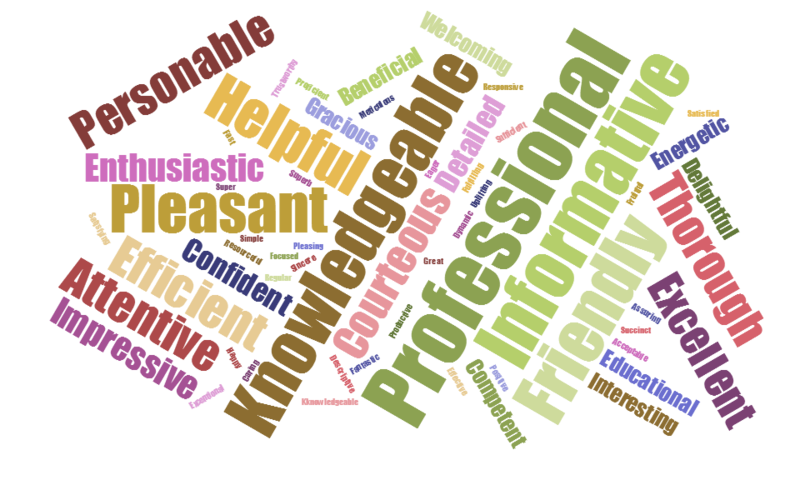 From this word cloud the drivers of positive purchase intent can be deduced. Potential bank customers respond to bankers who are professional, informative, knowledgeable, friendly, pleasant, helpful and attentive. What customers want is a banker who cares about their needs and has the ability to meet those needs. Conversely, shoppers who reported negative purchase intent as a result of the customer experience used the following adjectives to describe the customer experience. In comparison to the shops with positive purchase intent, the list of adjectives that describe shops with negative purchase intent is a little more nuanced. Adjectives like frustrating and disappointing are illuminative but not necessarily actionable; while adjectives such as rushed, inexperienced, indifferent, and pushy provide clear direction with respect to elements of the customer experience that undercut purchase intent. Bottom line: Customers want to do business with bankers who care about their needs and have the ability to satisfy those needs, and reject bankers who are inexperienced, indifferent, pushy or rush the customer through the transaction. When you look at these adjectives side by side, aren’t these opposite sides of the same coin? Research has determined the business attribute with the highest correlation to profitability is customer loyalty. Customer loyalty lowers sales and acquisition costs per customer by amortizing these costs across a longer lifetime – leading to some extraordinary financial results. In one study of the retail banking industry, a 5% increase in customer loyalty translated into an 85% increase in profits. Customer loyalty is driven by the entire relationship with bank. Image, positioning, products, price and service all mix together in the customer’s’ value equation as customers make a continual decision to remain loyal. What customer service attributes drive customer loyalty? This article summarizes research into specific transaction service attributes with the intent of identifying which transaction attributes drive customer loyalty, and provides an analytical tool to help managers determine which attributes will yield the highest potential for ROI in terms of improving customer loyalty. In order to determine transaction attributes which drive customer loyalty, Kinesis surveyed bank customers who had recently conducted a transaction at a branch. The next step in the research is to capture a measurement of loyalty against which to compare these attributes. Measuring customer loyalty in the context of a survey is difficult. Surveys best measure attitudes and perceptions. Loyalty is a behavior based on rational decisions customers make continually through the lifecycle of their relationship with the bank. Survey researchers therefore need to find a proxy measurement to determine customer loyalty. A researcher might measure customer tenure under the assumption that length of relationship predicts loyalty. However, customer tenure is a poor proxy. A customer with a long tenure may leave the bank, or a new customer may be very satisfied and highly loyal. Kinesis proposes a model for estimating customer loyalty based on two measurements: likelihood of referral and customer advocacy. Likelihood of referral captures a measurement of the customer’s likelihood to refer the bank to friend, relative or colleague. It stands to reason, if one is going to refer others to the bank, they will remain loyal as well. Because customers who are promoters of the bank are putting their reputational risk on the line, this willingness to put their reputational risk on the line is founded on a feeling of loyalty and trust. This concept of trust is perhaps more evident in the second measurement,: customer advocacy. Customer advocacy is captured by measuring agreement with the following statement: “My bank cares about me, not just the bottom line.” Customers who agree with this statement trust the bank to do right by them, and not subjugate their best interests to profits. Customers who trust their bank to do the right thing are more likely to remain loyal. 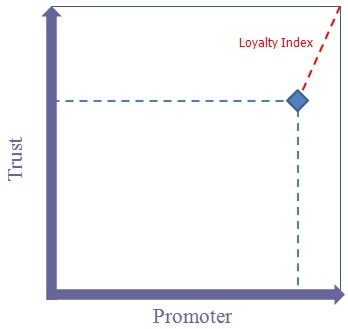 See Using Promoter and Trust Measurements to Calculate a Customer Loyalty Index for a complete description of this methodology. Calculating a loyalty index has value, but limited utility. A loyalty index alone does not give management much direction upon which to take action. One strategy to increase the actionably of the research is to use this index as a means to identify the service attributes that drive customer loyalty. Not all service attributes are equal; some play a larger role than others in driving customer loyalty. So…how does the research determine an attribute’s role or relationship to customer loyalty? One tool is to capture satisfaction ratings of specific service attributes and determine their correlation to the loyalty statistic. The Pearson correlation coefficient is a measure of the strength of a linear association between two variables. Note the Pearson values are negative; the loyalty estimate is an inverse, where lower values indicate a stronger estimate of loyalty. As a result the stronger negative correlation translates into a correlation to our estimate of loyalty. Having my best interests in mind. Two common themes in the top-four attributes are empathy and competence. Bank customers value relationships with banks that care about their needs and have the ability to satisfy those needs. Again, customer loyalty is driven by the entire relationship with bank. However, in terms of transactional service, customers clearly value empathy and competency and will reward banks who deliver on these two attributes with loyalty. A subject of perennial debate among those who manage customer service workers is whether good service skills are innate or trainable – a Nature versus Nurture argument. On the Nurture side are those who believe good service skills can be developed through training, coaching, clear standards and consistent measurement. They are willing to hire the Eliza Doolittles, hoping they can make a lady out of a flower girl. I have seen both approaches succeed (and fail), but the nature approach is becoming less tenable with time. It isn’t that workers with the right instincts are disappearing. The problem is there is far more service choices available to consumers than there was in the past. Expanded store hours, the proliferation of retail and restaurant chains, and the extraordinary growth of 24-hour call centers all contribute to an economy in which customer service workers are in high demand. As the competition for these workers has increased, the talent pool has been diluted. Companies nowadays rarely have the luxury of looking for Jeeves, so they must invest in the education of Eliza. Many organizations provided exemplary service through the nurture approach for a while, but few are able to keep it up for long. As they expand into new markets, opened up bigger call centers and faced periodic labor shortages, their ability to rely on hiring “the right people” became more difficult to sustain. Without a system in place for developing the not-so-right people, service quality declines. In many cases, companies who worked hard to differentiate themselves on the basis of superior service find themselves unable to maintain their reputation in the long run. Consider Eagle Hardware, the local home improvement retailer that was acquired by Lowe’s several years ago. In its first years the service at Eagle was head and shoulders above the competition. Positioning itself as a kinder and gentler Home Depot, Eagle provided exceptional service quality, with well-informed, helpful floor staff who took the initiative to approach customers and answer their questions. Encouraged by its success, Eagle expanded rapidly; however, as the the competition for service personnel increased service quality started to fall. One manager confided he had switched from being highly selective in his hiring to simply looking for “warm bodies” to fill his staffing needs. In fairness, the service at Eagle remained fairly good relative to many other chains; however, the expectations of its customers were higher, and thus, their disappointment greater when service declined. This is not to suggest managers should give up their search for the proper feudal spirit. At the least, they should continue screening out those who utterly lack the instinct for providing good service. There is no doubt many prospective hires are hopeless as customer service providers, and would do better looking for some other line of work. But it is the in-between service workers, those who are neither “naturals” nor hopeless cases, for whom better systems need to be developed. Consider the following scenario: Several years ago a video rental store, part of a national chain, set up shop in my Seattle neighborhood. The staff – all teenagers – were every customer’s nightmare. They talked on the phone with friends, were thoroughly uninformed about the video selection, and treated customers as annoyances who interfered with their personal conversations. After a year or two the store closed, lying vacant for several months before reopening under the management of another national chain. The service at the new store was excellent. Customers were greeted at the door, the employees were attentive and polite, and the manager – a real, live adult – was always present. Looking at the employees, I thought they seemed vaguely familiar, then realized several of them were the same hopeless cases who worked at the original store. The flower girls had returned as ladies. This is not an isolated case. Many businesses with vastly different levels of service exist virtually side-by-side, drawing from the same labor pool. Interviews with workers and managers reveal consistent patterns among the superior service providers: Lots of training and coaching, clear standards, plenty of feedback, and high expectations. Those workers with the proper feudal spirit tend to emerge as stand-outs and role models. The rest of the staff – the majority – are exactly as good as the system and processes that support them. When the system is well designed and administered it can survive expansion and tight labor markets – even without the assistance of nature.